LIFE SIZE MEMORIES "ELEPHANTS IN FRAMES"
2012 - documentary - 118 min. Distributed by Journeyman Pictures Two former photojournalists bring a large format camera to South-East Asia to portray Asian elephants living in captivity and to record their biographies. Ten years earlier, in 1999, they had spent months in a logging camp in a mountain range of western Burma. They go back to the same camp to find out whether the elephants they had filmed back in 1999 would still be there. After Burma, the photographers travel in three other Asian countries to determine how different cultures influence the fate of the animals and their future. The elephant memories become palpable while the life-size photographs reveal the individuals behind the collective and shapeless face of the species. We were war photographers, witnesses of an endless succession of conflicts, civil wars, disasters and misery. Every photographer is attracted to beauty and for us, came a time when we could only find beauty in nature. We had first encountered the elephants in Burma and, in 1999, we had made our first documentary film about timber elephants. 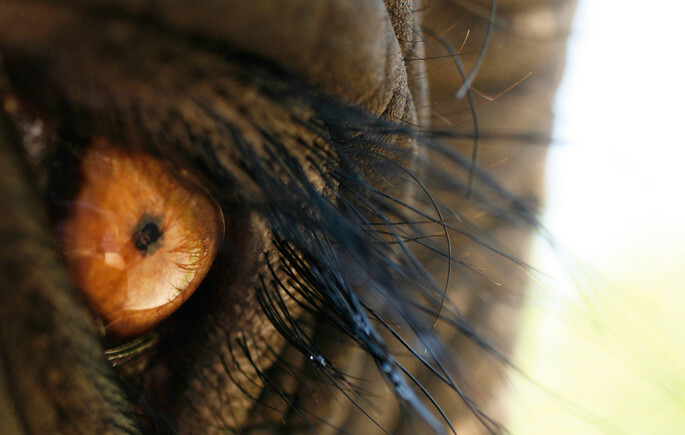 What is it about elephants that brings so much fascination? Elephants are a myth and a child's dream at the same time. We lived months with the elephants and it was a privilege. Soon we were able to recognize their features and their characters. Each one had a different face. From mere representatives of their species, we came to consider them as individuals...then persons. a reference...At the beginning of the 20th century, Edward S. Curtis, an American photographer traveled across the United States to produce a series of portraits of Native American Indians. Curtis' goal was not just to photograph, but to document, as much Indian traditional life as possible before it disappeared. The magic portraits are the only testimony of the Indians' past grandeur. It was with Curtis’ photographs in mind that we set out on our journey through South-East Asia. Our camera, although modern, resembles the wooden cameras that were created in the 1880s. It uses film holder plates and the photographer covers his head with a black cloth while framing the subject. The depth of field is very narrow and the subject cannot move...impossible to do with elephants? We witnessed the capture of wild elephants from the forest and the unbearably violent training of young calves. In both events, we found extreme human brutality. But we also found that the ancient sophisticated techniques used by the catchers or the trainers are in themselves an acknowledgment of the intelligence of their victims. Burmese elephant handlers say that the purpose of training is to break the spirit of the animal. The sentence itself sounds like recognition of their soul. Sri Lanka seems to propose another option: the abolition of slavery pure and simple; the end of domestication. There are a few remaining captive elephants here and soon they will be counted on the fingers of one hand. Elephants are wild animals and should be in national parks. People do not accept elephants in chains anymore, thinking that one day we will wonder how we could possibly inflict such predicaments to elephants. Sri Lanka is a small island and conflicts with farmers are an ongoing battle. Is there potentially enough space left to send the elephants back to the forest?